An artist’s public persona – their speeches, interviews or written works – often comes to define their intellectual or artistic image. Therefore, any artefact that offers a glimpse of their personal life becomes a delightful window into their minds and hearts. It is for this reason that we eagerly consume photographs, letters or journals entries of artists. 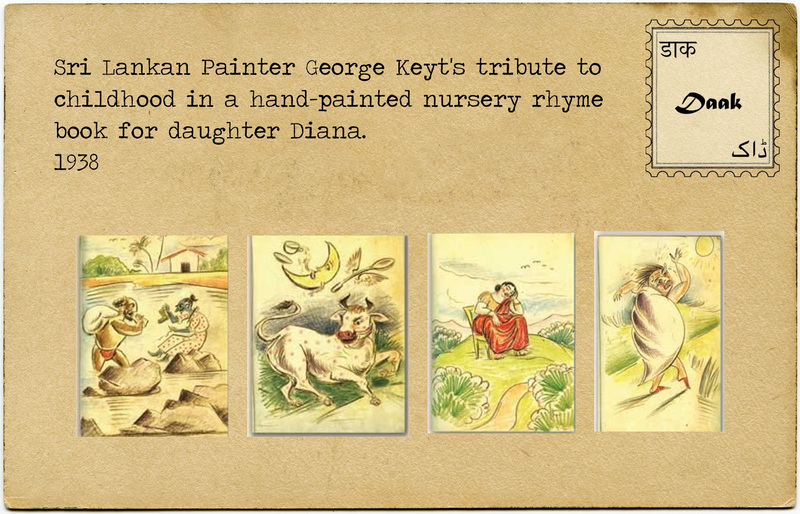 We discovered one such artefact from Sri Lanka: Painter George Keyt’s loving tribute to the joys and tribulations of childhood in a hand-painted book of nursery rhymes for his firstborn. Keyt deliberately uses a child’s voice and artistic sensibilities, seeing and representing the world through Diana’s eyes.